View of Overton Bridge. 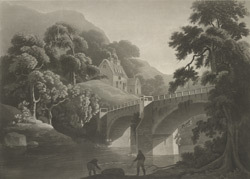 The two arched bridge, which crosses the River Dee, was built in the early 1800s from red sandstone. The bridge is thought to have been built by Mr Penson the County Surveyor of Flintdhire. Overton on Dee is situated 7 miles from Wrexham in North Wales.